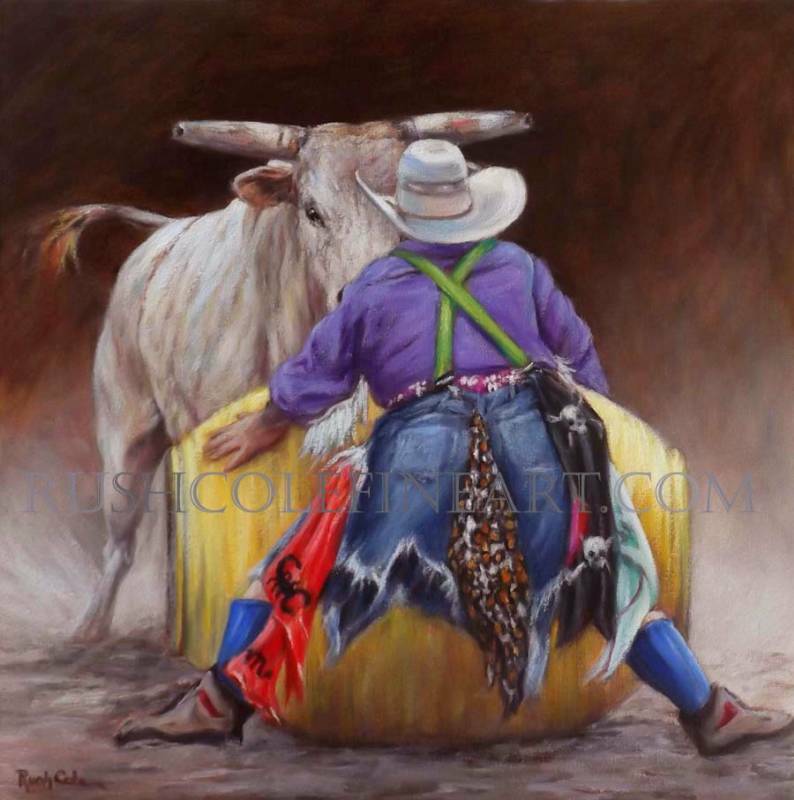 Limited Edition Giclee "GALISTEO BULL RIDER" Canvas Image Size: H: 36" x W: 52" x D: 1.25" Numbered & Signed (100): $2500.00 Artist Proof: (10) $2695 (Shipping costs are extra, per individual quote.) Exquisitely recreated on artist canvas, stretched on medium wooden bars, gallery-wrapped (image extends on all four sides, no framing necessary), numbered & signed., wired for exhibit. Certificate of Authenticity. Professionally Packed, Insured & Shipped via UPS. All Artwork guaranteed as shown. No exchanges, returns or refunds. In event of loss or damage in transit, Purchaser must contact Seller within 7 days of delivery for replacement of identical item. *Please allow 3-5 weeks from date of purchase for delivery. 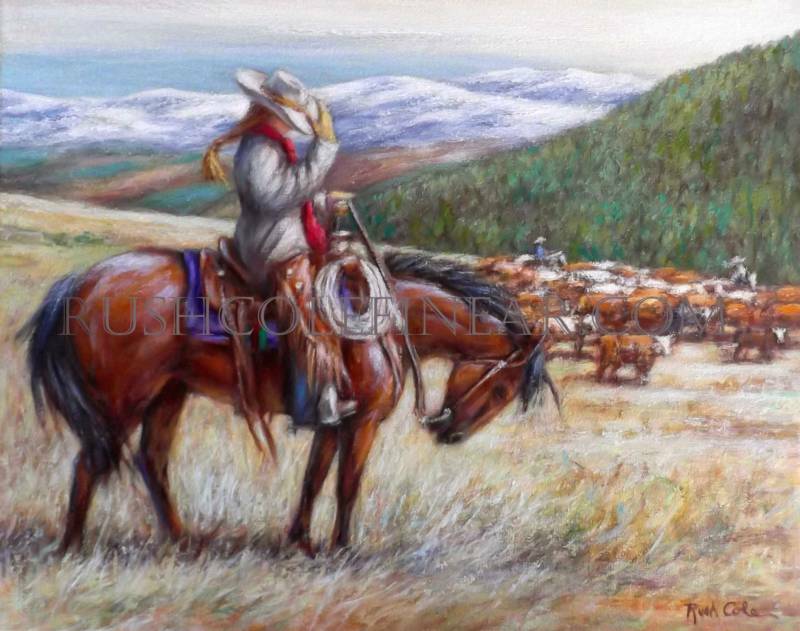 Limited Edition Giclee (CANVAS) Title: " BLUE STREAK" Image Size: H:24" x W:16" x D: 1.25" Numbered & Signed, Certificate of Authenticity. Gallery-wrapped, image extends around all four sides, stretched on wooden bars, double varnished, wired for exhibit. (No framing necessary.) Edition: (100) Price: $895 Artist Proof: (10) Price: $1055 (Shipping costs are extra, per individual quote.) Professionally packed, insured, and Shipped via UPS. No exchanges, returns, or refunds. In event of loss or damage in transit, Purchaser must contact Seller within 7 days of scheduled delivery for replacement of identical item. *Please allow 3 -4 weeks from date of purchase for delivery. 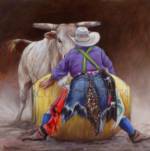 Limited Edition Giclee (CANVAS) Title: " BRING IT!" 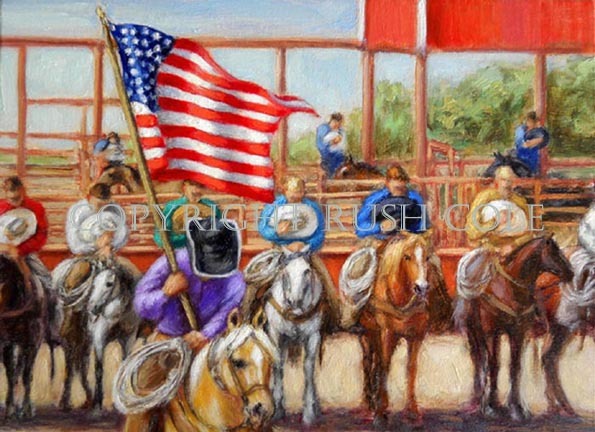 Image Size: H: 24" x W: 24" x D: 1.25" Numbered & Signed, Certificate of Authenticity. Gallery-wrapped, image extends around all four sides, stretched on wooden bars, double varnished, wired for exhibit. (No framing necessary.) Edition: (100) Price: $855 Artist Proof: (10) Price: $995 (Shipping costs are extra, per individual quote.) Professionally packed, insured, and Shipped via UPS. No exchanges, returns, or refunds. In event of loss or damage in transit, Purchaser must contact Seller within 7 days of scheduled delivery for replacement of identical item. *Please allow 3 -4 weeks from date of purchase for delivery. 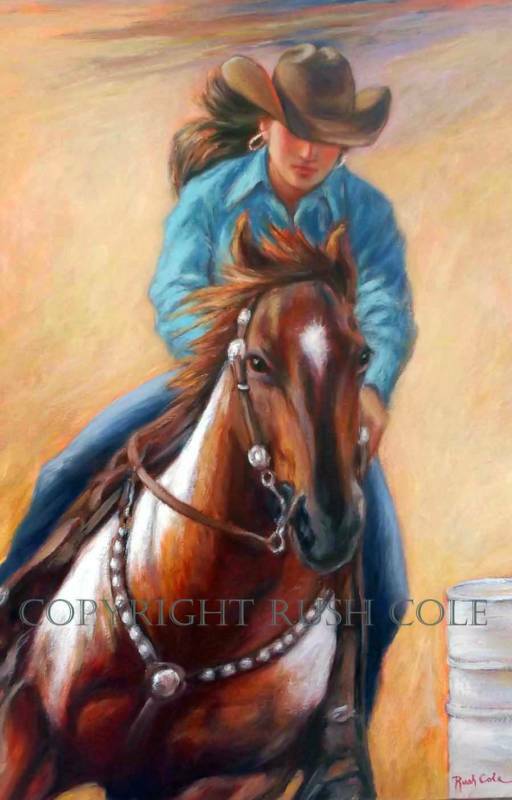 Limited Edition Giclee (CANVAS) Title: " COWGIRL IN THE WIND" Image Size: H:18" x W:23" x D: 1.25" Numbered & Signed, Certificate of Authenticity. Gallery-wrapped, image extends around all four sides, stretched on wooden bars, double varnished, wired for exhibit. (No framing necessary.) Edition: (100) Price: $855 Artist Proof: (10) Price: $995 (Shipping costs are extra, per individual quote.) Professionally packed, insured, and Shipped via UPS. No exchanges, returns, or refunds. In event of loss or damage in transit, Purchaser must contact Seller within 7 days of scheduled delivery for replacement of identical item. *Please allow 3 -4 weeks from date of purchase for delivery.